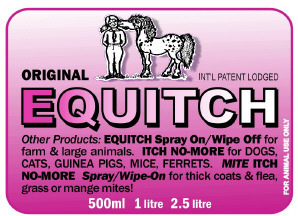 EquITCH was developed for use on our own animals over a period of 5 years and designed to relieve itchiness and repair the damage caused by the following conditions and to withstand the wet summer conditions in sub/tropical areas. This product is recommended for horses, cattle, sheep, goats, alpacas and is safe for application on young animals. ticks, mites & bot fly eggs! EQUITCH is made from powerful essential, mineral oils plus wood tar (dark base only) and contains no anaesthetics or antibiotics. It is renowned for its success in treating animals that do not respond to other products including cortisone. Curious about How Well EQUITCH Works? See the Photos and Read the Results from Clients! Rapidly relieve itchiness, redness & rashes! Promote rapid healing and hair regrowth - usually 1mm regrowth by 7th day! with our Secure Online Order Form! Can do for YOUR Animal Here! 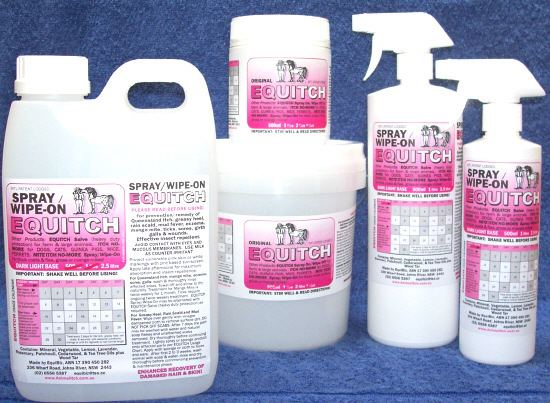 EQUITCH is available as a Salve or Spray/Wipe-On Oil. EQUITCH customers positively claim - Yes! It really works!! The Salve gives extra heavy duty protection for sensitive areas (bitten ears, faces, bald & sore body parts) in a very nurturing, gentle rub-on application. Where mutilation has been sustained it is recommended that the Salve be used at least for the first two weeks. The Spray/Wipe-On Oil, which can be applied with a sponge or cloth to heads and on spray-shy horses, provides a complementary quick and easy application which reaches the skin through full hair. It is also an excellent repellent for ticks, biting flies and cures mange mite & lice too! Both products provide a water repellent, pain free, no pick or scrub process in treating greasy heel, mud fever & rain scald so secondary infections are minimized. EQUITCH is also a very effective insect repellent. Many breeders use our products to protect their horses unable to be rugged because of housing/agistment conditions including foaling situations. Both products can be suuplied in light & dark bases for show purposes. Read EQUITCH Salve and Spray/Wipe-On Product Tips Here! SEASON STARTER KITS PLUS FREE GIFT!